Considering the lifestyle of Anders, Blake and Adam, it’s hard to imagine that they wouldn’t become douchebags. They’ve dabbled in crossing the line over to D-bag territory, but always come back to the lovable side of things. The main reason that these three aren’t unwatchably irritating is because of a childlike innocence. It’s almost like this trio found a Zoltar machine in elementary school, then decided to act like what they imagined people in college were like and never stopped. In “Brociopath,” we see the other side of this coin, the dark side of where the nonstop partying and bro-ing out could lead without their innocence. This darkness comes from Stan Halen, a supposed Oakley sales rep who says he has all-time legendary status at Kappa Zeta Nu, so the boys decide they want to join the fraternity, several years after getting kicked out of their college. The character of Stan is one of the most obnoxious characters I’ve ever seen on TV, probably because his dedication to quoting Anchorman and Happy Gilmore, all while having a nonstop focus on drinking literally anything with alcohol in it, seems a little too close to reality. It’s a frustrating character, but that’s the point. He has a confidence the guys can admire, but there’s clearly something wrong in his alcohol-addled head. Seeing these three interacting with someone so much bro-ier than themselves makes them all the more adorable. 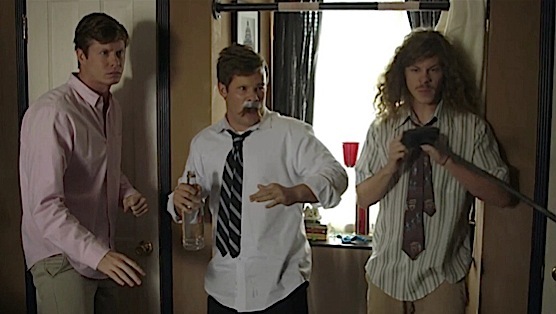 After picking up three girls by laying down in the road in front of a Jetta, the boys make out with the girls for seven hours, leaving Ders to state he feels like a real “studmuffin.” When Stan demands that his “pledges” put an alcohol-soaked tampon up their butts, Blake refuses, saying his back hole is for his wife, if she chooses to explore it one day. They just want to have fun, but not go insane and lose what little integrity they have. By the end, we discover that Stan was never in the fraternity and that this is all an escalation of some psychosis. When Ders and Blake realize that Adam is pledging to an insane person, the attempt to save Adam feels like it comes from a horror movie. Adam is covered in plastic wrap, has been forced to shave off part of his hair and one eyebrow to create a makeshift mustache and Stan is threatening to brand all of them with fraternity letters. It’s terrifying to think of a drunk crazy person chasing you with a red-hot brand, but hey, that’s what fraternities are all about. As much as the three guys want to be Stan Halen, they can’t be because they have some morals and hearts and well, they aren’t clinically insane. That innocence saves them from being true monsters and with a villain as big as Stan, it shows just why Workaholics works in the first place.